Earlier this year, protesters in Thailand attracted attention when they adopted the "three-finger salute" seen in The Hunger Games films. This led to the country's military instituting a ban on said motion, but now it's rising back up. 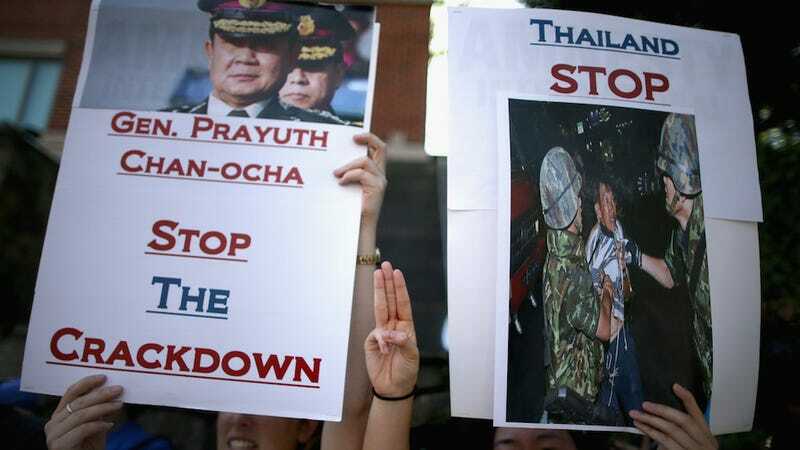 ...Five Thai students were detained today after flashing the salute. The students were wearing T-shirts emblazoned with "No Coup," the BBC reported, and stood up with their backs to Chan-Ocha while he spoke in the northeast city of Khon Kaen. In "The Hunger Games," the salute symbolizes rebellion against totalitarian rule, signifying thanks, admiration and good-bye to a loved one. But Thai protesters have also cited the French Revolution's values of liberty, equality, fraternity, while others said it means freedom, election and democracy. Screenings of Mockingjay have also been cancelled across the country by the Apex theater chain, allegedly under pressure from local police to tamp down on protests and meet-ups at the film, according to an organizer.